Wilbur Wright is an American aviator, engineer, inventor, and aviation pioneer. He built the first aircraft, the Wright Flyer, with his brother, Orville Wright. 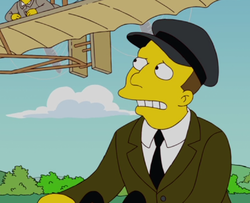 In a dream, Bart had about brother say he to his brother at it's his turn when he chasing his brother on bike, which was sitting in the Wright Flyer. Modified on February 28, 2018, at 19:26.